French composer Laurent Durupt is awarded the first Tenso Young Composers Award. The jury (James Wood, Kaspars Putniņš and Leo Samama) chose Durupt from the three finalists that participated in the final round of the Tenso Young Composers Workshop 2010-2011 that took place in Riga in March 2011. The other two finalists where Maria Kallionpää (Finland / Austria) and Lauri Mäntysaari (Finland). The jury was highly impressed by the work that the three participants brought to the second round of the workshop. All scores – whether sketches or complete pieces – showed maturity and well-thought-out writing for choir, and in many ways they are on a par with the work of better-known contemporary composers. The awarding of a final prize is not a judgment on the works that were presented during the workshop, but should be seen as an encouragement for a young composer to write a new work for a cappella choir. 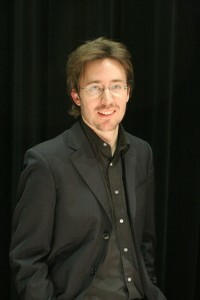 In their unanimous choice to give the award to Laurent Durupt, the jury was persuaded by the promise of this young composer who is now starting to develop his musical ideas in scores for choir. The jury is convinced that Laurent Durupt has a story to tell, and looks forward to hearing more from this promising young composer. The commissioned piece …. souffler sur quelques lueurs … was premiered by Cappella Amsterdam during Tenso Days Mechelen in May 2015. Durupt wrote a short text about Akikaze (pdf), the work he presented at the workshop.